Even as countries continue to ratify and implement an international treaty prohibiting the use of cluster munitions, casualties from these notorious weapons doubled in the past year, with civilians accounting for nearly all the victims, according to a United Nations-backed civil society report. The annual monitoring report released at the UN Office at Geneva by the Cluster Munition Coalition revealed the use of cluster munitions in war-torn Syria and Yemen caused even more civilian casualties. In both countries, conflict and insecurity are additionally hampering clearance of the deadly weapons. Of nearly 1,000 victims identified in 10 countries, almost all were from Syria, according to the Cluster Munition Monitor 2017. 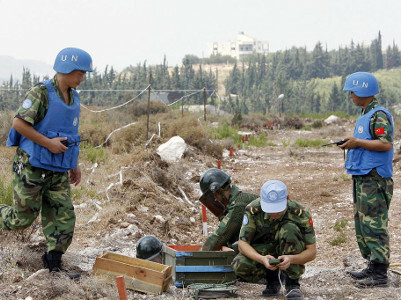 “The humanitarian devastation caused by cluster munitions is particularly acute in Syria, where use has continued unabated since mid-2012,” the report’s main editor and co-ordinator of the Landmine and Cluster Munition Monitor initiative Jeff Abramson said, warning the real figure was much higher. The threat from cluster munitions is rarely short-lived, according to the report, which records casualties in places where the weapons have not been used for decades. More than 100 people were known to have been killed or injured by previously unexploded cluster munition sub-munitions, the landmine-like remnants left over from earlier attacks, including in south-east Asian countries such as Lao People’s Democratic Republic. There, all 51 new casualties in 2016 were the result of remnants from cluster munitions used in the 1960s and 1970s. Overall, the report identified at least 971 new cluster munition casualties globally in 2016, with 860 in Syria. Disturbingly, the number of casualties in 2016 is more than double the number recorded in 2015 (417), making it the second-highest annual figure since Cluster Munition Monitor reporting began in 2009, the highest was in 2013. Since August 2016, two countries – Benin and Madagascar – ratified the Convention on Cluster Munitions, bringing to 102 the number of State Parties. Another 17 States have signed but not yet ratified the convention. Last December, 141 states, including 32 non-signatories, adopted a UN General Assembly resolution supporting the Convention on Cluster Munitions. “Efforts to grow the Convention’s membership continue to be central to stigmatise the use of these weapons and to end the threat they pose. Convention members have a better understanding of the location and scale of contamination and will more readily share information about it, compared with states outside the convention,” said Amelie Chayer, acting Director of the Cluster Munition Coalition.